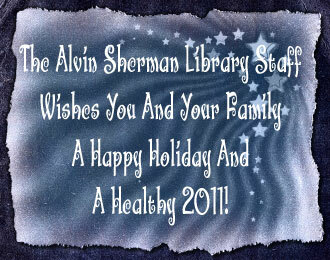 This holiday season consider sharing with your friends and family the ultimate "green gift"... an Alvin Sherman Library Card. You can share our online application with them or suggest they visit our amazing state-of-the art facility to apply for their card. They can receive their card immediately! It's a great gift for the young ones as well. 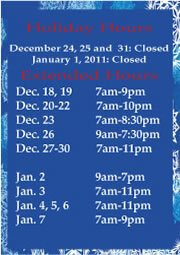 As we all struggle a little this holiday season, why not share a gift that will last a lifetime! During this Holiday Season there is no better time to enjoy music. To learn more about music resources online...click here. KIDS ROCK WITH THE OUTER TOONS! 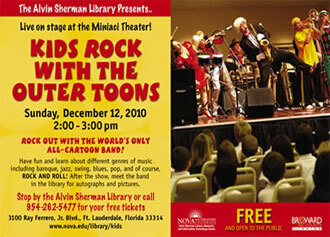 Live on stage at the Miniaci Theater: Rock out with the world’s only all-cartoon band! Have fun and learn about different genres of music including baroque, jazz, swing, blues, pop, and of course, ROCK AND ROLL! This colorful, lively musical concert will take place in the Miniaci Theater. 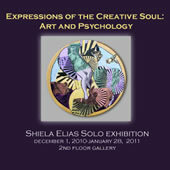 Call 954-262-5477 for your free tickets. After the show, meet the band in the library for autographs and pictures. 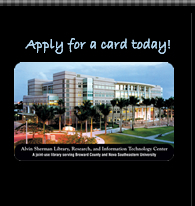 Get up-to-date info on teen events for ages 13-18 by becoming a fan of “Teen Events at the NSU Alvin Sherman Library” on Facebook. Join the Geneaological Society of Broward County for its monthly meeting. Bring a friend! Damira Feldman, Russian-born concert pianist, will delight you with her eclectic and comprehensive repertoire. She has received rave reviews for her dynamic and dramatic interpretation of composers ranging from 17th century Classicism to 20th century Modernism. Take a break from the holiday rush and make your very own craft piece using pine cones, glitter, silk flowers and more. Materials are free. Bring your imagination and enthusiasm. 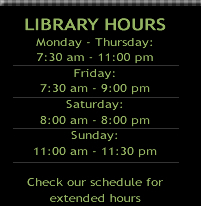 Refresh your word processing, Internet search, and e-mail usage skills. Bring your questions. The class is adapted to each participant’s needs. Register here! Max 22 persons.